Volume 11 of the Gabriel Wells Definitive Edition of Mark Twain's works is The Prince and the Pauper. The Appreciation was written by Kate Douglas Wiggin shortly before her death in 1923. Wiggin was born in Philadelphia, the daughter of attorney Robert N. Smith. As a young adult, she relocated to California, taught for a short time at Santa Barbara College and later started a free kindergarten in San Francisco. Her kindergarten teaching strategies became the inspiration for sixty other schools for poor children west of the Rocky Mountains. After marrying San Francisco attorney Samuel Bradley Wiggin, Kate began her writing career. In 1888 the couple relocated to New York where her husband died the following year. 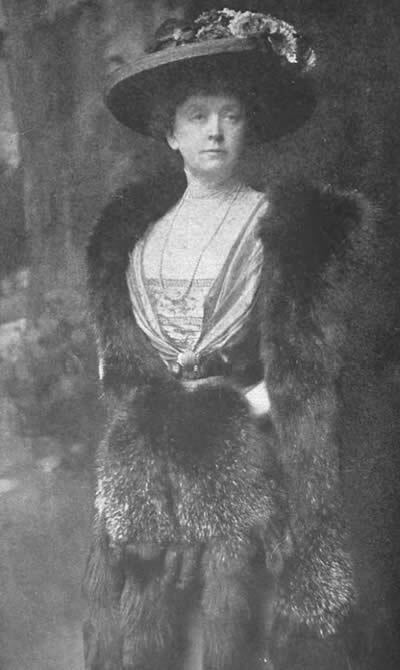 In 1895 Wiggin remarried George Christopher Riggs but retained the name Wiggin for her literary career. In 1903 her greatest success Rebecca of Sunnybrook Farm was published. This book was followed two years later by Rose o' the River. Samuel Clemens recorded in his personal notebook that he visited with Kate Wiggin at the home of a mutual friend in January 1894 and enjoyed her charming debates regarding kindergarten teaching methods. Clemens and his wife Livy socialized with both Kate and her husband Samuel Wiggin during the 1900s. At Clemens's seventieth birthday celebration hosted by Harper and Brothers on December 5, 1905, he was seated between Kate Douglas Wiggin and fellow author Mary E. Wilkins Freeman. In 1906 Clemens worked with Wiggin on behalf of copyright legislation to benefit American authors. In a letter to a family member Clemens referred to Wiggin as "That rare bird & darling of mine, Kate Douglas Wiggin Riggs" (Gribben, p. 768). OF what did Mark Twain, the well-beloved, the inimitable, master of jest and philosophy, of tears as well as smiles -- of what did he dream in those long days on the Mississippi steamboats, while the pilot recorded the soundings and the brown flood swirled by? Did those wonderful eyes of his turn away from their dull, commonplace surroundings and gaze with longing into the many-colored web of history, and was it in some such sunlit vision that the story of The Prince and the Pauper came to him? "In all the full-shelved Libraries of Romance" there are few tales more romantic, and it may well be that the born story-teller, for such he was, told it to himself at first, in a passionate revolt against the net of realism in which he struggled. "To divine the nature of a convention and to use its capabilities to the utmost is a special mark of genius," says a celebrated English critic, and in The Prince and the Pauper Mark Twain assuredly showed his grasp of the conventions which govern the romantic tale. "It may have happened," as his own preface says; "it may not have happened; but it could have happened," and possibilities -- soap-bubble possibilities, iridescent, shimmering, lightly-floating-are all that a romance needs for its foundations. Dedicated, as the book is, "to those good-mannered and agreeable children, Susy and Clara Clemens," it probably was read to them as it progressed, and the dedicating phrase brings up a picture of the five children together -- the prince-pauper, the pauper-prince, the "good-mannered" Susy, Clara, and the author himself, each as young as all and all as young as each. We can see father and daughters exulting over the exploits of the "poor little ash-cat," the spurious prince, and ready to weep over the sorrows and trials that befell the royal lad who so rashly assumed his playmate's rags, and in so doing, Tom Canty "of Offal Court out of Pudding Lane" became for a season Prince of Limitless Plenty, and Edward Tudor himself the Prince of Poverty. We can hear Mark Twain's quiet chuckles as he makes game of royalty and royal customs, depicting the formal putting on of Tom's shirt in the morning, when it slipped through so many ministering hands that it seemed like passing buckets at a fire; or painting the horrors when the First Lord of the Bedchamber received the royal hose and found their strings were gone! "To the Tower with the Head-keeper of the King's Hose!" exclaims the Chief Equerry in Waiting, and he leans, fainting, upon the shoulder of the First Lord of the Buckhounds; for hereditary customs were stronger than the laws of the Medes and Persians in those days. When Tom's nose itched, and the Master of Ceremonies not present, behold here was a dead wall, and nothing in English history to tell how to get over it; consequently Tom defied etiquette and scratched it himself! All these drolleries and twinkles of fun break through the blue of pure romance as the tale goes on, and make the lively and dramatic episodes more lively still. It is told in simple style, but it is really a Primer of English Manners and Customs in the time of Edward, and the author gives us chapter and verse for all his facts. The River Pageant, the Mummery, the King's Banquet, the Recognition Procession, Coronation Day, all stand out clear and sharp, and are not to be despised as First Aids to English History. The two lads, and Miles Hendon, the faithful squire of the real prince, are the central figures of the story, and a charming humor and tenderness are combined in Hendon's whimsical relations with his liege lord. Long may he sit in the presence of loyalty, great-hearted, dauntless champion! There is a real lesson, too, which is of universal value, in the experiences of the wandering prince among his subjects, and his first-hand knowledge of the working of old laws and customs which, had he remained in regal aloofness, he could never have learned. None feel the nettles but those who grasp them, and the royal Edward gravely says, as the story draws to its close, "Kings should go to school to their own laws at times, and so learn mercy." And so we leave him on his throne, practicing that "twice bless'd" virtue, with Tom Canty now made the " King's Ward " and Chief Governor of Christ's Hospital, and Miles Hendon a belted earl, since nothing less would content the writer or reader of true romance. But what, after all, is the value of an introduction to a work of genius? One can but strike a few soft chords upon one's harp and the reader is where the born story-teller wills him to be -- in a land where, after the pangs of misadventure are past, the good and the beautiful, the brave and the fair, are "happy ever after," and the villains meet with their just punishments. THE Prince and the Pauper was one of the books which Mark Twain wrote in instalments -- the labor covering a period of several years. It was begun during the summer of 1877, when the author had been trying his hand at play-writing, and it was first conceived in dramatic form. The idea for the tale came to him one day at Quarry Farm, when he picked up a little book entitled The Prince and the Page, by Charlotte M. Yonge. It was a story of Edward I. of England and his cousins Henry and Richard de Montfort; in part it presented the submerged personality of the latter, picturing him as having dwelt in disguise as a blind beggar for a period of years. It was a story of a sort and with a setting that Mark Twain loved, and as he read there came a correlative idea: not only would he disguise a prince as a beggar, but a beggar as a prince. He would have them change places in the world, and each learn the burdens of the other's life. It is proper to say here that there is no further point of resemblance between The Prince and the Pauper and the tale that inspired it. No one would ever guess that the one had grown out of the other, and no comparison of any sort is possible between them. My idea is to afford a realizing sense of the exceeding severity of the laws of that day by inflicting some of their penalties upon the king himself, and by allowing him a chance to see the rest of them applied to others; all of which is to account for certain mildnesses which distinguished Edward VI's reign from those that preceded it and followed it. Clemens wrote about four hundred manuscript pages of the tale that summer; then the inspiration lagged, and he put it aside, as was his habit. He did not touch it again for more than three years. He did not take it up, in fact, until he had made an extended tour through Europe and written another book -- the story of his travels, A Tramp Abroad. It was from the long labor of that book that he turned for relief to the story of the wandering prince. He was back in Hartford by this time, and he had able assistance. Besides Mrs. Clemens there were two little girls, Susy and Clara Clemens, old enough to listen and to delight in that half-real, half-fairy history of the wandering prince and the royal pauper. There is nothing like such an audience when one is writing juvenile literature, and the charm and simplicity of the story may be accounted as measurably due to these two small listeners to whom it was adapted in that early day of its creation. Mark Twain recognized this debt when he dedicated the book to "those good-mannered and agreeable children, Susy and Clara Clemens." He did not finish the book that winter, but later took it with him to Quarry Farm, and there, in his beautiful study, brought it to an end. Later in the year he revised it and sent it to Howells, so often his literary adviser. Howells approved of it, and James R. Osgood published it elaborately and expensively, as was its author's wish. It was really his pet book at this time, and in a letter to his mother he said that both Mrs. Clemens and himself had agreed that it should be "elegantly gotten up, even if the elegance eats up the publisher's profits and mine too." The story itself and the manner of its production -- the happy home atmosphere of its first hearing -- had given them all an affection for the little tale, which, somehow, it seems to carry to its readers even to this day. The Prince and the Pauper came from the press in December, 1881-- an elaborate and extremely handsome book for those days. The story itself was totally unlike anything that Mark Twain had ever done before, and not all of the critics knew quite how to receive it. Some of them suspected a joke -- they had not learned yet to take Mark Twain seriously. He had been afraid of this, and at one time had been inclined to publish the story anonymously (as later he did his Joan of Arc} to avert any such misunderstanding. Yet there were many favorable notices. A number of reviewers expressed gratification in the fact that Mark Twain had at last given his delicate fancy and fertile imagination, as well as his hatred of humbug and manly love of truth, a fitting presentation. Indeed, the tale is a beautiful one, and how breathlessly interesting! We may imagine that first little audience at Mark Twain's fireside hanging expectant on every paragraph, hungering for more. Perhaps the judgment of the years will not rank it as his greatest story, but certainly it is his loveliest tale of pure romance, and it has an imperishable charm. 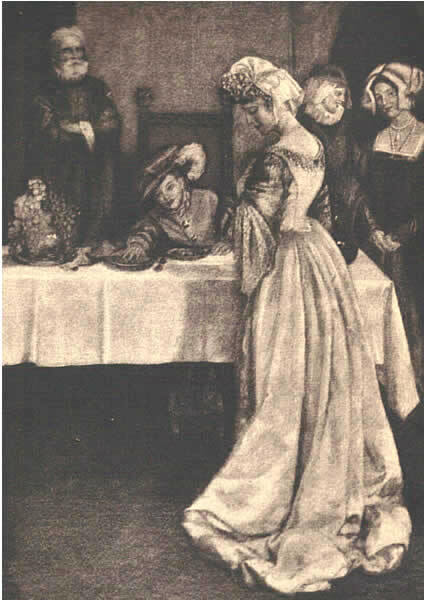 The Gabriel Wells Definitive Edition of The Prince and the Pauper features an unsigned and uncredited frontispiece titled "Tom's First Royal Dinner." The illustration had not appeared previously in uniform edition of Mark Twain's works. Three additional illustrations by Frank Thayer Merrill that had appeared in American Publishing Company's 1899 uniform edition are reused. It is likely that "Tom's First Royal Dinner" is also by Merrill but was not used in 1899 when a portrait of Mark Twain and his daughters was utilized for the frontispiece of the earlier volume. "Kate D. Wiggin Dies in London," The New York Times, 25 August 1923, p. 7.